Sublime Text 3 Syntax Definitition for Cisco router/switch/firewall configurations. 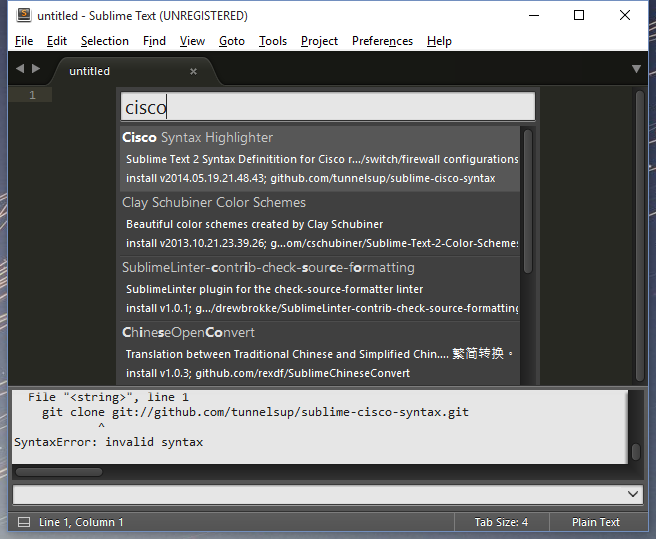 This package will highlight Cisco configuration and commands within Sublime Text 3. Using Package Control: If you have package control installed then installing this is a snap. Simply open the command palette (Tools->Command Palette). Then type “install” then search for this plugin by typing “Cisco Syntax Highlighter”. That’s it. It should be installed. Without Git: Download the zip from github, and extract the files to your Sublime Text “Packages” directory, into a new directory named Cisco. You can find the packages directy by going to Preferences -> Browse packages, within Sublime Text 3. Once installed navigate to View->Syntax->Cisco to apply the Cisco syntax to the document. This syntax definition will automatically be applied to .txt files and .cfg files. Using control-/ will comment out any line that is highlighted. Once Cisco syntax is turned on you can then try different color schemes by going to Preferences -> Color Schemes. If you wish to customize this even further for your own needs navigate to the Cisco package (Preferences -> Browse Packages). Edit the Cisco Definitions.json-tmlanguage file within Sublime Text 2. Install AAAPackageDev. After your changes go to Tools -> Build, to rebuild the syntax definitions. You are currently reading "Cisco IOS Syntax Highlighting Packages for Sublime Text 3"